Balkinization: Thurgood Marshall and Martin Luther King, Jr.
Martin Luther King, Jr., whose birthday is celebrated today, and civil rights litigator Thurgood Marshall, were rivals in the 1960s, and are often thought of through the lens of conflict within the civil rights community. But there were important moments when the two came together. It was not just that the NAACP and the Legal Defense Fund represented King, for example during the Montgomery Bus Boycott. In 1964, Marshall, who generally supported legal change rather than civil disobedience, himself demonstrated on behalf of King’s philosophy of social change. The occasion was the 1964 triennial national convention of the Episcopal Church, held in St. Louis, Missouri. Marshall was the first African American delegate from the New York diocese to attend. The conference honored Martin Luther King Jr., who was about to leave for Norway to receive the Nobel Peace Prize. King addressed the convention, calling upon Episcopalians to help with the civil rights struggle in the South. Most applauded, but some white delegates refused either to stand for King or to applaud. The trouble occurred afterward at the House of Deputies meeting, when a resolution was introduced that spoke to the principles of King’s philosophy of nonviolent civil disobedience. The resolution “recognized the right of persons to disobey segregation laws that are in ‘basic conflict with the concept of human dignity under God.’” Civil disobedience had to be nonviolent, done only after “earnestly seeking the will of God in prayer.” Many in the clergy supported the proposal, but a number of lay delegates opposed it. “This is the first time in all of the history of this church that we have been asked to take a position that recognizes the right of people to disobey the law,” a Minneapolis delegate complained. “This is the way to chaos.” Reverend Gordon E. Gilett of Illinois responded: “One of my ancestors picked up a musket at Lexington and fought the British and I am certain we agree that was one of the greatest acts of civil disobedience.” When the measure came to a vote, it had the support of a majority of the clergy but did not receive enough support from lay delegates. The resolution was rejected. In protest, Marshall walked out. Here is a Federal judge, the very embodiment of our law, acting as though he had turned in his judicial robes for a pair of sneakers and a CORE sweatshirt. The spectacle is ludicrous and not a little hypocritical. This endorsement would have been an invitation to anarchy! There were important differences within the civil rights movement, and between Marshall and King. But just as the civil rights era changed America, it changed its participants. Perhaps King's national holiday is an appropriate time to reflect on the way, across what we usually think of as a divide between the movement and the lawyers, one leader supported another's message. This passage is taken from Mary L. Dudziak, Exporting American Dreams: Thurgood Marshall's African Journey (Oxford University Press, forthcoming 2008). 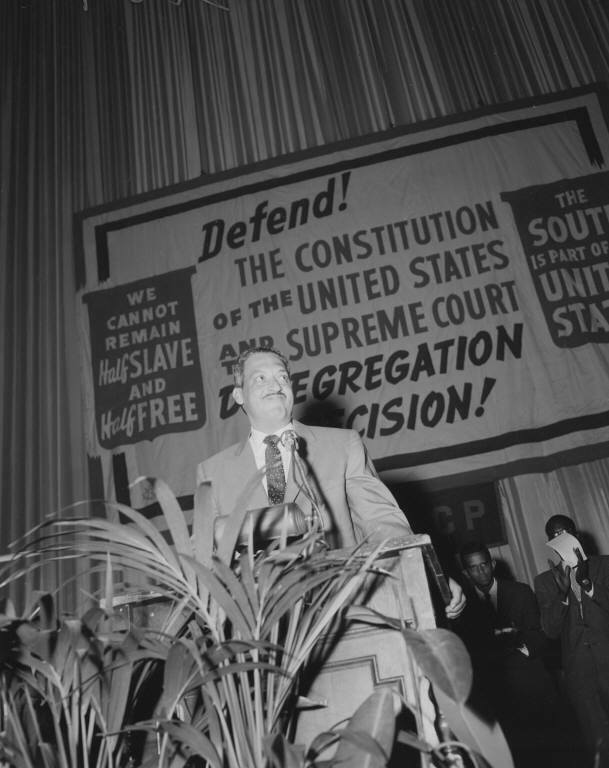 Photo credits: Martin Luther King, Jr.; Thurgood Marshall addresses an NAACP conference. Another putative rival of King's was of course Malcolm X, yet it seems these two giants may have held visions that were "complementary" and perhaps "moving toward convergence:' See James H. Cone's wonderful study, Martin & Malcolm & America: A Dream or a Nightmare (Maryknoll, NY: Orbis Books, 1991). In a comment to a post on King by Frank Pasquale at Concurring Opinons I suggest a few titles that help to "situate" King's contributions to the civil rights movement and the struggle for social justice.